'Ajmo svi u Omladinski...Center for Children and Youth – Vrnjačka Banja is founded in February 2002 but officially registered 24.07.2002. Supply of all equipment was donated by SDC, War child and French Ministry for foreign affairs, through implementing partner TGH - France. The activities started in order to offer to children and youth of Vrnjacka Banja an alternative of street life and place where they can discover and develop their talents and abilities such they can be active participants in the local community life. Basic goal of YC is to offer to kids and youth numerous out-school activities and to help them to fulfil their free time with useful work, protect them from street life (drugs, alcohol and violence) and offer them psychosocial help. Youth centre is opened for everybody at age between 6 and 25 years regardless their belong ness (local population, refugees, IDPs). Until now (period between April 2002 - August 2005) services used more than 800 beneficiaries. Working time of Centre is from 10 to 22h every day for entertainment, but activities are mostly at the afternoons from 17 till 22h during the school year, and the entire day during the holidays and Saturdays. Centre is located in the centre of Vrnjacka Banja, Kraljevacka street bb, in Shopping centre "Pijaca" with premises of 180 m2. Educative Workshops: Computer courses, English, French and Italian language courses, Ecology workshop, help in homework in Match, Physics, Chemistry, Serbian, French and English. Creative Workshops: Design, school of painting, sculpturing, engraving, weaving, school of acting. Almost each Saturday in the Youth centre are organized tribunes for the adolescent with the different topics (psycho-social, health, cultural, entertainment,...) In our work we organize public events once per month. In previous period we have organized the cross, competition in table tennis and football, a lot of performances of drama section. We have organized many exhibitions of children pieces of art. Also we were active out of Youth centre. Theatre group participated on camp on Kopaonik from 15-18.02.2003 with kids from Belgrade and Serbian school from Swiss organized by Ministry for education. Also, we have contacts with beneficiaries of YC-Zemun. 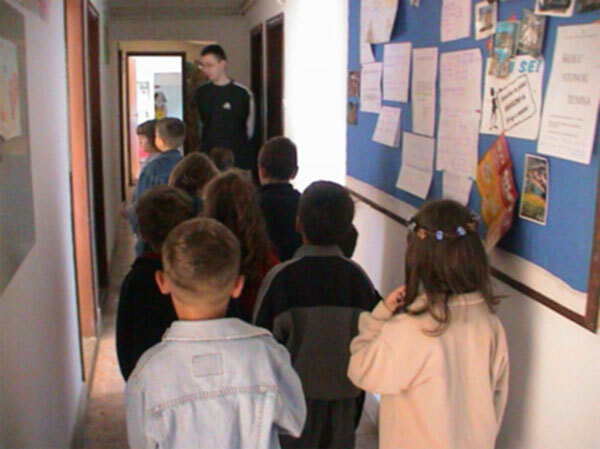 Kids and youth from YC Zemun visited our centre twice and we visited them once. Our Centre was visited by Theatre studio "Dečji osmeh" from Belgrade, NGO "Dečja radost" from Gnjilane, Kosovo, and many basic schools form various Serbian towns. Partnerships: YC have very good relations with local self-government (Municipality is partner and participates with premises, electricity, water and heating costs), International Humanitarian Organization "Triangle Generation Humanitaire" from France who supplied Centre with equipment and funded all activities from April 2002 till June 2003), cooperation with Youth Centre in Zemun, Youth theatre studio "Decji osmeh" from Belgrade, local NGO "Duga" Vrnjačka Banja, NGO "Zdravo da ste" Vrnjačka Banja, Republic and Federal Ministry of Education and Sport, Swimming club "Delfin" from Vrnjačka Banja, "Specijalna bolnica" Vrnjačka Banja and other local institutions. Centre for Children and Youth - Vrnjacka Banja is member of ECYC. Projects: "Rent a bike" - ACDI/VOCA (USAID) May-October 2004; "A Little International Illustrated Primer" - MJC Bazin (UNESCO) April-December 2004; "Strengthening of the awareness for protecting of health life surrounding" - supported by REC (Regional environmental Centre) with finance support by European Commission – Europe Aid; "Youth newspapers" ACDI/VOCA (USAID) June-December 2005. Staffs are consisted of 15 educated and skilled animators who lead workshops and 2 guards who are responsible to keep order in the Centre through animation kids in fun activities. Jedeš fast fud - Ti si lud! Copyright © 2019 Youth Center Vrnjačka Banja. All Rights Reserved.